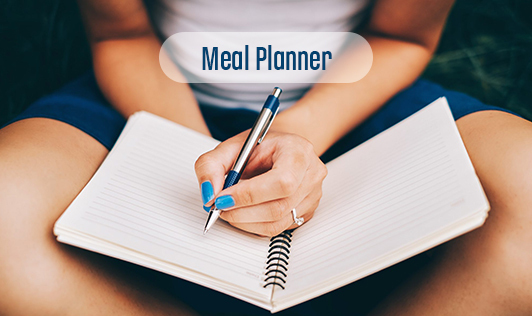 There are various benefits of using a meal planner, whether it is a formal planner or simply a few notes jotted down. A little pre- planning, can help you save time and money. Developing a meal plan can also help you eat a more nutritious, well-balanced diet that includes nutrient-rich foods from each of the five food groups. You may find that you can better manage your weight if you plan and prepare meals at home more often. Remember to include beverages in your meal plan to identify where you may be taking in empty calories or have opportunities to add food groups like milk or fruit. Regardless of how you decide to meal plan, taking some time to think about preparing meals ahead will help you save time, money and eat healthier!